Liz and Savannah present their research. Chandrima introduces Jian Payandeh of Genentech Inc.
Doug and Sheila take a pause for a photo at Doug's D.E.B. Chalk Talk, discussing one of Doug's favorite DNA repair proteins, MUTYH, in his talk titled, "Elucidation of the role of DNA glycosylase MUTYH in a cell death response to alkylating agents." Jazmin Stenson discusses her summer project work in the David Lab at the ChemEnergy REU & CCB-GAP Poster Session. The David/Beal Lab Kickball Game: The Beal Lab won the trophy back this year - but we will be looking to bring it back to its rightful home in 2018! 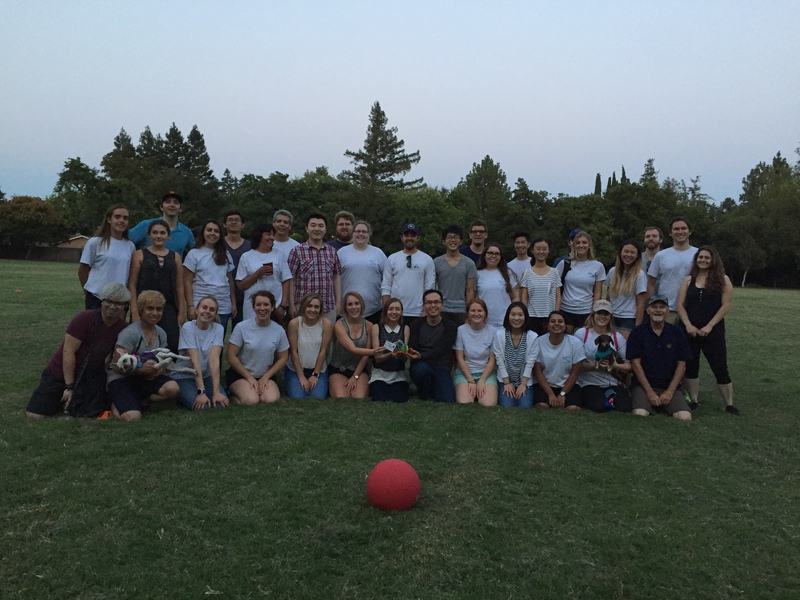 The David/Beal Lab Kickball Game: The Beal Lab won the trophy back this year – but we will be looking to bring it back to its rightful home in 2018! Nicole with Sheila at Graduation 2017: Congratulations for all of your success in earning your Ph.D., Nicole! Graduation 2017: Holly, Taylor, Sheila, and Nicole are coming up with the next big idea. Today, UC Davis…tomorrow, the world! The David Lab crashes Graduation 2017. The David Lab Interpretive Reenactment of BER: Beware of oxidative damaging agents, but luckily there are proteins around to repair the precious DNA. As in any system, a few inactive proteins can also be observed. Congratulations to Dr. Manlove as she reserves her space on the David Lab wall during her hand print ceremony! Phil is leaving his mark in the David Lab hand print ceremony. Congratulations, Dr. Yuen!